Purchased from the pet shop in the Covered Market in 1976, Emmanuelle is the most important resident at Regent’s, lovingly cared for by staff and students. Originally thought to be male, she was called Emanuel, but in more recent years it has been confirmed that she is a female and a slight adjustment was made to her name to reflect this. Emmanuelle was a regular winner at the Corpus Christi Tortoise Fair during the 1980s and 1990s, and starred in Blue Peter in the 1980s, as photographs in the JCR bear witness, but in recent years has lost her form, probably getting bored with the TV lights and razzmatazz of celebrity status. 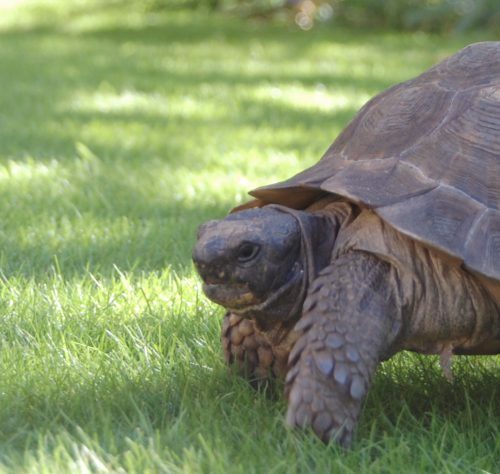 She still regularly competes in the Tortoise Fair (an ‘Emmanuelle Cup’ is extant in the College Archive in the Angus Library which records her lifetime service to the sport of tortoise-racing), and in recent years has started to regain her old form, coming third in the 2013 race. Students celebrated her ‘eleventy-first’ birthday party in summer 2014, raising over £700 for charity. The position of ‘Tortoise Keeper’ exists as a JCR-elected position, traditionally held by a first-year student. In addition to this, Emmanuelle is a full Member of the JCR as a mark of the affection in which she is held by the students.